The BrilliantK9 harness is designed differently than the majority of walking tools, such as collars, head collars and other harnesses. 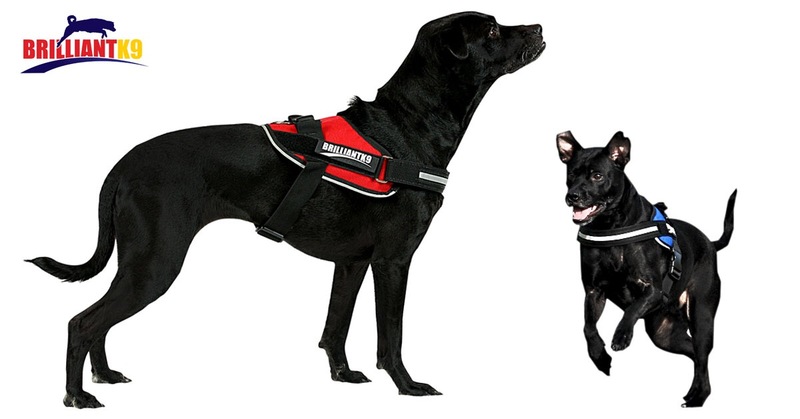 The BrilliantK9 harness keeps pressure off the neck, and allows freedom of front-end movement while limiting the dog’s effectiveness at pulling. Collars are a common device used to walk dogs. The point at which the collar hits not only strains the spinal cord, but can also strain the vessels that connect to the nose, eyes and ears, which, in turn, will compromise a dog’s five natural senses. In addition, the pressure from a collar could irritate or damage the thyroid glands, which are also located on the anterior portion of the dog’s neck. Other common devices used to walk the dog are head halters and harnesses. While head halters may be effective, they are not always the best option for a dog with anxiety issues or a previous neck injury. The majority of harnesses are designed based on a Schutzhund style, having the main points of the harness focus on the dog’s ribcage, shoulders, and upper body. When a dog pulls in a Shutzhund style harness, the dog drops its’ hind end in order to shift the majority of their body weight into their front end for more power. This hind end drop will stress the dog’s knees and hips, as well as its’ lower back. When all of their body weight has been shifted forward, the harness will put direct pressure on or around the shoulder blades, which will restrict movement, causing wear and tear on the muscles and ligaments in that area. The BrilliantK9 harness derived its’ ergonomic design with the help of veterinarians, canine sports trainers, chiropractors, acupuncturists, along with agility World Team members and coaches. The harness was designed to allow freedom of movement while taking advantage of a dog’s natural pivot point. The saddle portion of the harness was designed to swaddle a dog’s back, keeping them calm and comfortable, making it great for the anxious or nervous dog. The non-water absorbent material will not retain water, making it useful for swimming and under water treadmill work. The chest strap of the harness is seated above the dog’s shoulder blades, but below the trachea, allowing free range of motion while keeping the neck free of pressure. The girth strap is seated just behind the last few ribs of the ribcage, and over the sternum, which is the natural pivot point of a dog. Thus, when the dog pulls, the girth lifts them upwards at their pivot point, limiting their effectiveness at pulling. When a dog is ineffective at pulling, it is apt to decrease or discontinue pulling. The BrilliantK9 harness was designed with the dog’s best interest in mind, but the owners were not forgotten. The 15 sizes and 22 colors and patterns were created to keep both ends of the leash wagging.